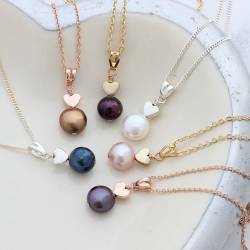 Featuring a solitaire freshwater pearl suspended from a heart shaped pendant, this enchanting Wedding Day Necklace will add the finishing touch to any bridal gown, bridesmaid dress, or pretty flower girl ensemble. Naturally beautiful and timeless in design, this Single Pearl Bridal Pendant is stunning in its simplicity, which is perhaps why it is adored by bridal party members of every age. Available in sterling silver or yellow gold plate, it is the perfect piece of wedding jewellery for traditional brides who are looking to surprise their bridesmaids and flower girls with a wedding day keepsake that they can wear forever. Sterling silver, gold fill or gold plate and freshwater pearls. Gold fill is a superior type of gold plate. The sterling silver chain has a silver extension chain so the shortest length is 16"/ 40cm but it extends upto 18"/ 45cm. The gold version chain lengths are 16"/40cm or 18"/45cm. The pearl is approx 9mm and the pendant hangs approx 2.6cm from the chain.